Pop-X (POP culture eXplotion) is an event which showcases the love of fans for popular culture. It is a new brand of event that is specially created by Red Cloud Interactive in order to give something back to the fans of popular culture. The event will be officially launched during Mata Expo 2016 at One Esplanade, Mall of Asia Complex on February 4, 2017. 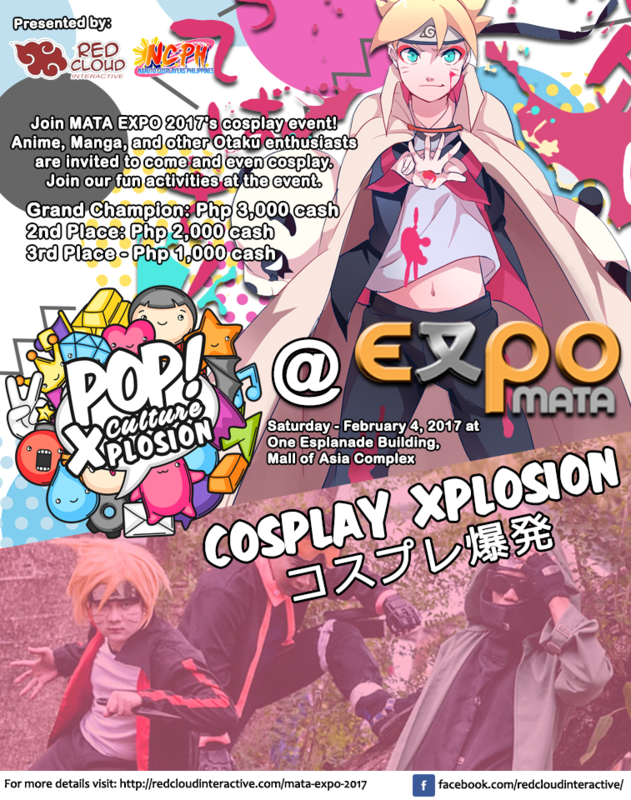 We will showcase two pop culture segments at Mata Expo 2017 – Cosplay and KPop. The fee is Php2,500 per booth. Booth owner needs to pay the booth fee not later than January 15, 2017, to reserve the booth. Booths are on a first-come-first-serve basis. Mata Expo is an annual event which is organized for the benefit of the deaf. More than that, however, it is an event which is also being held in Japan and the United States annually. With its international prominence, Mata Expo will be a venue for the expression and appreciation of pop culture. Tickets during the event are priced at Php 500.00, however, we will be offering discounted tickets for event participants at 50% off for Cosplay fans and KPop fans. 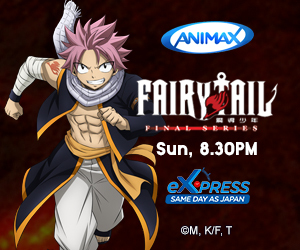 Cosplay as your favorite manga, anime, game or movie character and register at here. Cosplay Xplosion Online Registration is closed. Upon registration, you will get a chance to win Php 3,000 in cash as the Grand Champion of Cosplay Xplosion. 2nd and 3rd places will also receive Php 2,000 and Php 1,000 in cash respectively. CHARACTERIZATION – 30% – how the cosplayers portrayed the character of the chosen cosplay. PERFORMANCE – 30% – the cosplayers performance on stage. COSPLAYER’S APPEAL – 30% – the appeal of the cosplayer in his/her costume and his/her appeal if other costumes will be fitted to him/her. AUDIENCE IMPACT – 10% – how the audience received the cosplayer. Naruto Cosplayers PH (NCPH) will be the official partner for this event. Lastly, for more information on Pop-X: Cosplay Explosion you can visit this Facebook event page. 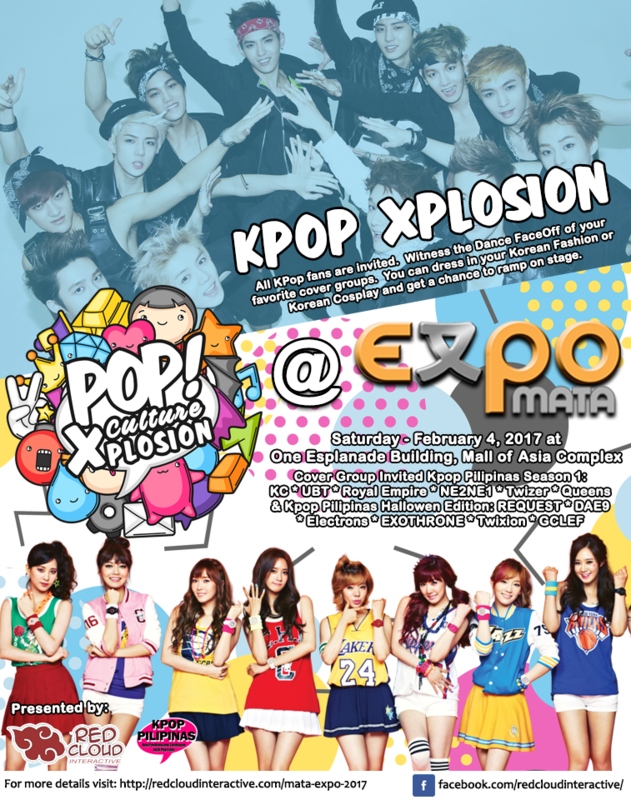 KPop Pilipinas will be part of Pop-X at Mata Expo 2016. As part of the event, a KPop Dance Face Off will happen between the top 6 ranking finalists of KPop Pilipinas Season 1 and KPop Pilipinas Halloween Edition. The face-off determines the KPOP PILIPINAS ULTIMATE KPOP COVER GROUP 2016, as a result, will also receive Php5,000 in cash. Criteria for judging includes: Choreography – 30%, Stage Execution – 30%, Costume and Stage Presence – 15%, and Audience Vote – 25%. Audience Vote is the official vote of the audience for your group. We will have voting slots for your group in which the audience can vote for you. The highest voted group receives 25% while the lowest receive only 2%. We will also open the stage for all KPop fashion stylists and KPop cosplayers. Show off your fashion and cosplay on stage and amaze the international audience. For rules and mechanics of the Dance Faceoff and other information on Pop-X: KPop Xplosion at Mata Expo you can visit the official Facebook event page. Also, KPop fans and supporters of cover groups can get discounted tickets just click here. This entry was posted in Events and tagged cosplay competition, kpop competition, kpop pilipinas, mata expo, naruto cosplayers ph, pop-x. Bookmark the permalink.